Portpatrick RNLI Lifeboat Week for 2015 starts on 2 August. We still have a few rooms available- contact us now! Lifeboat week is always a very popular time to visit Portpatrick and the week is crammed full of events. Another great reason to stay at Rickwood – our wee hotel by Portpatrick Golf Course. 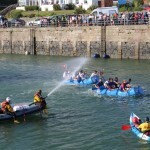 The raft race in Portpatrick Harbour is great fun and always one of the highlights of Lifeboat Week. Portpatrick Lifeboat Week starts on Sunday 2 August. We hope you will join us here in Portpatrick during Lifeboat Week and that you will book your accommodation soon as we are filling up fast! Here is a look at the official programme for Lifeboat Week. Portpatrick Brewery is busy brewing a special real ale for Life Boat Week. You should be able to sample some at The Crown. 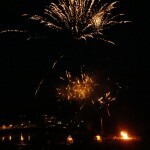 8.00-10.30pm Grand Finale- Wheel of Fortune & Glow Sticks, Crew BBQ, Draw of Major Raffle, Bonfire Firework Display.